Editor’s note: Another weekly column in the Wanganui Chronicle. At the risk of sounding repetitive, cold and damp homes have considerable impact on many aspects of our society. The good news is that every home can be made healthier with careful thought and directed effort. A few dollars doesn’t hurt either. Often times, sorting the warmth is easier than sorting the dry. In other words, there seems to be much more confusion about managing moisture than managing heat. I have received a number of emails recently regarding indoor humidity, so this seems like a good time to address the topic. The best way to minimize indoor humidity is to manage the sources of moisture themselves. In many homes, there are four to five major sources of water vapour: cooking, showering, airing laundry indoors, and using an unflued gas heater. For homes with raised floors (piled), rising damp can be added to this list. Steam from cooking and showering can be effectively managed by using extractor fans vented to the outdoors and not into the ceiling space. For bathrooms, it’s a good idea to put a 10-minute delay timer on your extractor fan. Moisture coming off of wet clothes and unflued gas heaters is best controlled by avoidance. Put another way, try not to do either if at all possible. Whenever you are able, try to dry your clothes outdoors on the line. If the weather does not cooperate, airing them in a shed or under a deck or waiting for a sunny, windy day would be preferable. For homes that are built on piles, rising damp can be the largest source of internal moisture by a country mile, accounting for 40-60 litres per day depending on the size of the structure, soil type, drainage, and subfloor ventilation. Dealing to rising damp can be as easy as laying a ground vapour barrier (aka damp-proof membrane) or – in my case – improving drainage around the perimeter of the structure, increasing subfloor ventilation and then installing a ground vapour barrier. Over the last six months I have spent hundreds of hours and dollars on all three of these. I finished the work two days before the recent deluge arrived. Ironically, the lowest moisture reading ever recorded inside our home (so far) was the day 88 millimeters of rain fell on our roof. The combination of drainage work, builder’s polythene and more vents has reduced the indoor humidity from a very unhealthy 85% when we arrived to 64% – a level just within what is considered healthy. There is no sign of mould and we can literally feel the difference in the air. Dehumidifiers are brilliant, and we have used one up until recently. It’s there at the ready should we need it, but like a positive pressure ventilation system installed in a roof cavity it only removes the damp that is already inside our home. Like modern medicine, treating causes is better and more cost effective than treating symptoms. 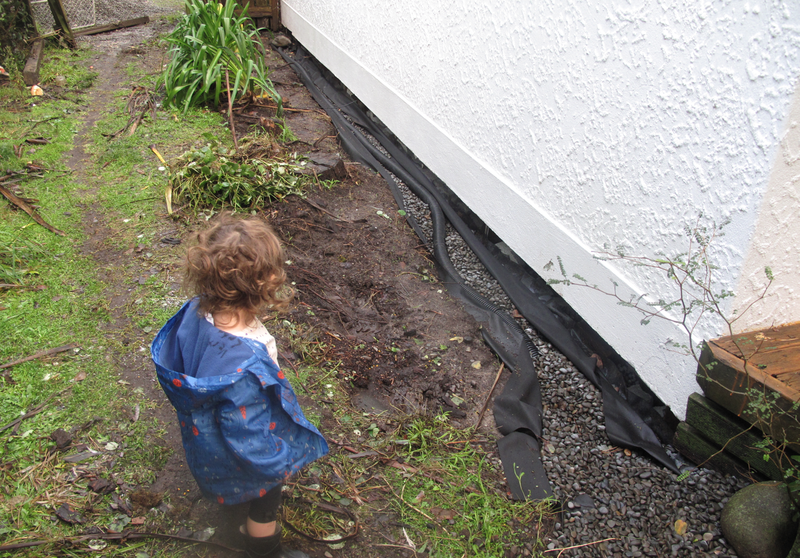 The following tips come from “Reducing Moisture and Condensation” available free at: http://www.ecodesignadvisor.org.nz. Keep beds and furniture at least a hand-width from external walls. Wipe condensation from windows as soon as you see it. Leave wardrobe doors slightly ajar to allow air circulation. Regularly check for mould behind curtains and furniture, and in corners. Spray a mixture of 70% white vinegar and 30% water on mouldy surfaces, leave for 15 minutes to an hour, and then scrub. Be sure to rinse off the vinegar afterward with a sponge. This is extremely important as mould will grow back on the vinegar residue if not rinsed properly. Wash or dry clean affected curtains. If there is no extractor fan in the bathroom, open windows when showering or bathing. Flush your home with fresh air once or twice each day for 10 to 20 minutes by opening windows and doors. During winter months the best time to do this is around mid-day when outdoor temperatures are highest. It is better to fully flush the home with fresh air than to leave windows ajar all day and night. Only consider a positive pressure or dilution ventilation system as a last resort. They are not suitable for all houses and can cause more problems than they solve. Research shows they make homes 2-3 degrees colder. There are better ways to manage moisture in 95% of homes. What can be done for a Concrete slab floor? Particularly one where we suspect the underfloor membrane might be broken in one spot (it rots carpet). Hi Richard, For one home with a damp basement room I suggested: pulling up the carpet, laying polythene, laying H-3.2 fence rails with polystyrene in between and then a plywood raised floor and new carpet. The result is an insulated, dry floor. In that application it worked easily because there were no doors opening into the room and no woodwork to adjust. We just needed to add a small step up into the room.